Wow. 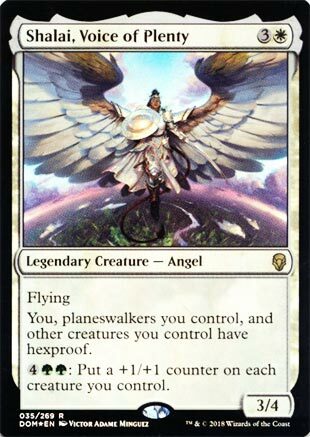 I mean that – Shalai has one of the most aggressively-costed hexproof-to-player abilities around, since only True Believer and Aegis of the Gods cost less, and both of those are more fragile than she is. When you add the fact that she grants it to other creatures you control as well, she might even be undercosted. The fact that she doesn’t grant it to herself makes it harder for her to get out of hand, but any deck that has to wait for her to attack or relies on damage-based removal will have to wait and worry. There are many situations where letting her controller untap with six mana in play will basically be fatal, especially if it’s a larger card pool and there are the sorts of cards that care about +1/+1 counters in the situation (hello, Bramblewood Paragon!). Shalai, Voice of Plenty reminds me of Innistrad. Specifically Gavony Township’s counter generation and Sigarda, Heron’s Grace’s Hexproof. This abilities combine to make a situation where your opponent will be unable to deal with your creatures unless they deal with Shalai first. The 4 toughness is nice and protects her from most red removal. She gets even better with a Lyra Dawnbringer or Angel of Invention the next turn. There are plenty of Counters Matter cards in Battlebond (like freaking Doubling season) and a plethora of even more options in Commander. Shalai is…pretty good, it turns out. A 3/4 for 4 with flying makes her hard to remove, and her activated ability is pretty nuts. If she gets it off once, your board gets even harder to clear out. Adding insult to injury is that Shalai is the only eligible target for removal while on the board, so getting past her can be an obstacle for decks. She’s a good block to red-heavy decks, she’s able to end games on her own, and she plays well with others…she’s one of the best rares in Dominaria, and she’ll see play in many formats.